You saw it, I'm sure. 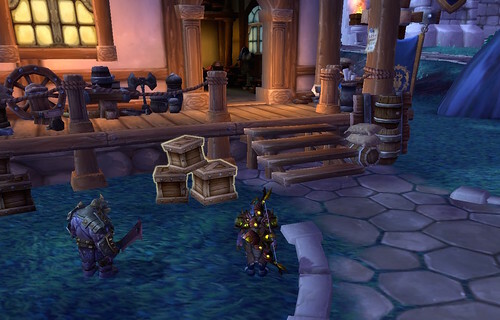 In Patch 6.2, you're going to need 6,000 garrison resources to build the next big thing, a shipyard. You need 5,000 to build the thing and 1,000 to make it operational. After BlizzardWatch reported this, Blizzard attempted to walk back the number. WarcraftDevs @WarcraftDevs@BlizzardWatch It is a placeholder amount. We'll lower it for an upcoming build to avoid further confusion. While they say they are lowering it, I wouldn't be surprised if the 6,000 figure sticks. You need to have a level 3 garrison to build the shipyard. Once you get to level 3, making the required amount of resources should not be a problem. I routinely max out my resources 4-5 times per week. That's 10,000 resources, regularly, even if I use up a chunk of them. Let me tell you how I do it. First of all, I am not spending resources. I don't have anything I'm desperate to obtain which needs resources. I recommend that unless you have things you need to spend resources for, don't spend them until you have 6k. "Need" is the operative word here. If you don't have 6,000 resources, save until you do. Don't spend any other than what you would use to send followers out on missions. Admittedly, if you are upgrading a garrison, your resources have to go towards that project. But you need to spend them there if you want the shipyard. Make sure you're spending your resources toward the things that lead towards the shipyard. Second, look at those missions. Here were my available missions for Thursday. I have a hierarchy of which missions to take. (I use the add-on Master Plan to see, at a glance, what I have available and whether I can be successful in completing it.) I'm working on the achievement, The Rarer The Better, so my first order of business, after gearing up any followers who need it, is to send them out on any rare missions. To me, it doesn't matter if it's a 645 or a 90 mission. If it's rare, I do it first. I am a bit over half-way toward the achievement so this order won't change any time soon. 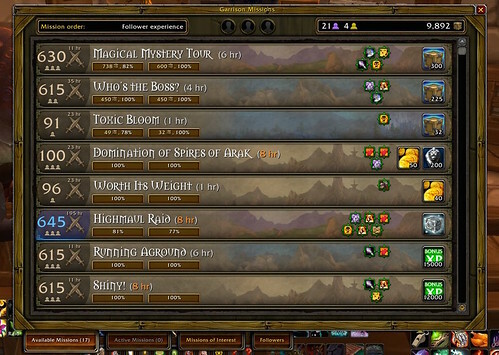 Then, looking at my garrison resources at the upper right of the panel, I see that I don't really need resources. Even when I deploy all my followers, the amount of resources I have isn't going to get below 9800. So, gold is the next priority. (I'm saving for the hippo mount from the apexis vendor.) Then, I take any gear missions I have. Even a 570 level piece is gold in my bank. When that's done, I start taking the resource missions. 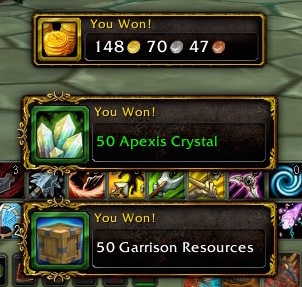 If my garrison resources are below 8,000, and they will be on Tuesday when I use resources to buy seals for raiding, I change the hierarchy of missions. The amount of resources I have on Tuesday determines if I use those or apexis crystals or a combination of each, to buy seals. My personal cut off is 8,000 resources. If I am below 8,000, then I flip flop the gold and garrison resource missions. Resources then come before gold in the hierarchy of what I do. Got that? Okay moving on. Your followers have been dispatched. Let's look around my garrison. Your first stop for resources should be the pile next to Sargent Crowler. The maximum amount allowed in this pile is 500. If you have a stack that looks like this, check your resource total before clicking on it. This stack will take whatever amount you have available up to 10,000. So, if you only need 322 resources to hit 10,000, that's all you're going to get out of this stack, regardless of how many have accumulated. I can't tell you the number of times I have failed to accumulate the full amount in the stack because I was close to the cap. Know before you click because you don't want to leave 100 resources simply because you're at the cap. If you are accumulating resources, you'll want to let this pile go for over 12 hours so it can stockpile more. The resources accumulate over a 12 hour period. They won't accrue to 500 if you keep clicking on the pile. Click it once per log in session and let it be. It's tempting, oh is it tempting, but you get more resources if you click once and leave it alone. Next stop is my Trading Post. If you need resources, this is your single biggest help to gain them. As long as I have work orders going, I have resources out front waiting for me. Trading Post resources accumulate, period. So far, the most I have ever received was 850. There may be a cap; I would venture to say 1,000 would be a good guess. I've never hit that number to know. Trading Posts are medium-sized buildings. The Sha'tari quartermaster takes up residence inside and the trader who will ultimately allow you to make the auctioneer is inside with an insidious ! over his head. I really wish Blizzard would let you turn in the pieces of the auctioneer as you make them. I have them rattling around in my bags so, when I get a piece I can see if I've already made that or if I need this for the next step. I used to be able to sell my extra pieces but it seems the bottom has dropped out of that market, so I donate them to my guild. I don't remember if I can vendor the extra parts, which is an option if something doesn't sell and your guild mates don't want it. Anyway, you accumulate resources by trading in materials. It varies from day to day what materials will buy the work orders. You can't assign a follower to the Trading Post to increase your work orders. I check what's wanted every session. If the materials needed are something I have in abundance, then I take the order. If it's something, like leather, which I don't have much of, I will pass this over because I don't really need the resources. Taking the work orders depends upon what you're using your materials for and whether you are pushing resource accumulation. The nice thing about Trading Post resources and resources from missions, you can't accept the full amounts if doing so puts you over the cap. You'll have a mission you can't complete and you'll have a stack of boxes in front of your Trading Post you can't remove. I've found that I sometimes can't start new work orders if I have resources out front I haven't picked up. Sometimes I can, however. There are other ways to get resources. 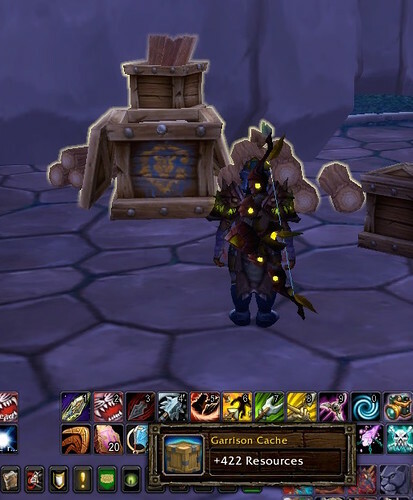 An invasion of a garrison can net you around 150 or more resources if you get a gold rating. Invasions are huge fun. I see people asking in General Chat for help with invasions. You can only get loot once per week, however. A lumber mill returns resources. I don't have one of those so I don't know how much it provides. Doing the daily dungeon quest nets 175 resources, but finding a group is a challenge so I don't consider this a reliable method, particularly if you're dps. Most rares will drop resources when killed. Some will drop tokens with additional resources. Once you kill a rare out in the world, it ceases to become rare and won't drop any more resources. Rare farming, which you can do in the areas where apexis dailies are, is not a reliable way to gather resources, although some rares are great for testing your soloing capabilities. Many treasure chests contain resources. But some, even when I see them on the map, are nearly impossible to find. Perhaps utilizing a mapping add-on like Tom Tom would help, but if I can't see them, I can't see them. I don't find this reliable. Another unreliable source, but it's worth a mention, is fishing pools. I've fished resources out of pools while going for the fish in those pools. All of these, excepting the lumber mill, should be considered supplemental sources. It took some time to get to 8,000 resources. I used to hear, in guild chat, people talking about being resource starved. I never was. I assessed what was important to me and spent my resources accordingly. I didn't upgrade buildings until I was 500 resources over what was needed. I think that helped me get to, and stay at, the cap. I hope you find this helpful. If I've forgotten any other way to get resources, please let us know in the comments. And, if you have a lumber mill, how many resources do you get?